The Lord is my Shepherd, I shall not want. He makes me lie down in green pastures: He leads me beside still and restful waters. He refreshes and restores my life; He leads me in the paths of righteousness for His name’s sake………….. When you get watered by God you become cleansed, refreshed and healed. He leads us in that journey to perfection. The refreshing living water that comes forth from Mount Zion causes the increase. “I planted, Apollos watered, but God all the while was making it grow and He gave the increase”. Watering the seed of God’s Word. The field can become parched and dry from a long drought but only God can give the increase. He causes the seed to take root and spring up. Only God can cause the seed to come alive. God’s truth sown in the centre of your heart, a heart prepared. He promises rest and refreshment when we rest in His promises, in the serenity of our Saviour, Jesus Christ. That crystal clear river flowing from the throne of God. The pure, eternal river of life. Revelation 22:1-2, Revelation 21:10-11. It’s crystal clear waters reflect God’s glory in His glistening, eternal stream. That everlasting life flows from God to His people. 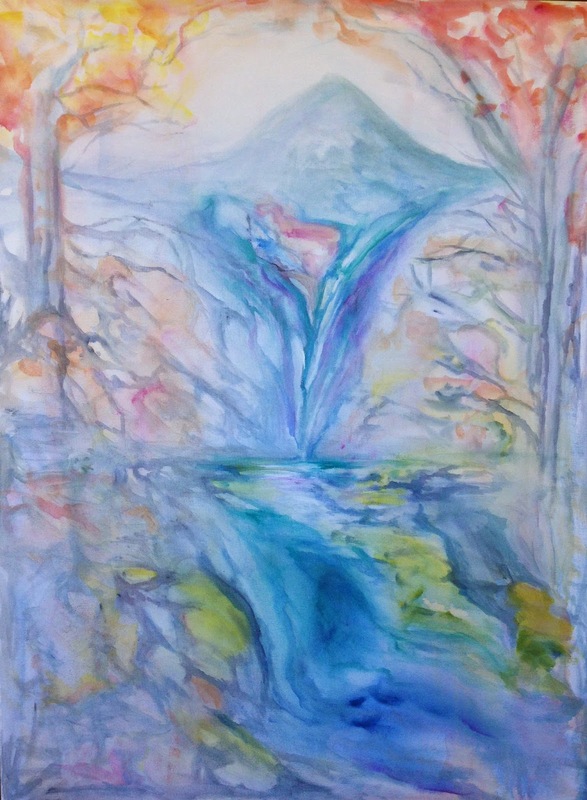 In the painting the streams coming forth from Mount Zion are merging to become one with the Father. They symbolize the gathering of souls together, coming into maturity and flowing in the still waters of His love. 13 As one whom his mother comforts, so I will comfort you; and you shall be comforted in Jerusalem. The streams which flow from the Fountain of Living Waters, those waters of refreshment. Those who are led by his comforting still waters walk in His path of righteousness and peace. The Lord will lead our path.